Leonardo, Michelangelo, Donatello, Raphael, and the rest of the pizza-eating bunch are here in this collection that presents the first four Teenage Mutant Ninja Turtles feature films. Included here are Teenage Mutant Ninja Turtles, Teenage Mutant Ninja Turtles II: The Secret Of The Ooze, Teenage Mutant Ninja Turtles III: Turtles In Time, and TMNT. $25.398 million on -unknown- screens. Has it really been 25 years since Teenage Mutant Ninja Turtles lit up movie screens? No – though the release of the “Teenage Mutant Ninja Turtles 25th Anniversary Collector’s Edition” might imply that the original flick hit theaters in 1984, it actually came out in 1990. 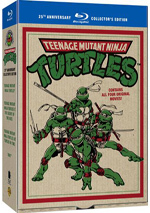 The Turtles comic book series debuted in 1984, so that’s the anniversary the boxed set celebrates. It seems strange to celebrate the 25th anniversary of a comic book with a movie boxed set, but whatever rings up sales at the register! It’s amazing to think about what a sensation the Turtles were back in the day. 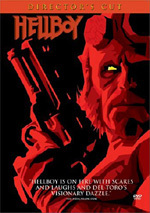 The original movie had a small budget and no stars but went to rack up a terrific $135 million at the box office. It also spawned two less successful sequels that I’ll address in subsequent reviews. The original Turtles flick acts as our formal introduction to the characters. Radioactive waste lands on some turtles and transforms them into talking, humanoid creatures. 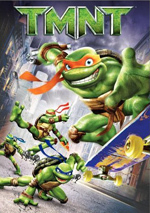 The crew includes Michelangelo (acted by Michelan Sisti, voiced by Robbie Rist), Raphael (Josh Pais), Leonardo (David Forman/ Brian Tochi) and Donatello (Leif Tilden/Corey Feldman). Another affected creature – Splinter the rat (David McCharen) – takes in the turtles and trains them in martial arts. The Turtles live in a New York City in the midst of a massive crime wave. Teens work as operatives for a vicious boss named Shredder (James Saito) and his Foot Clan. Assisted by TV reporter April O’Neil (Judith Hoag) and fellow vigilante Casey Jones (Elias Koteas), the Turtles take on Shredder and his minions as they try to restore order to the Big Apple – and rescue the kidnapped Splinter. Some folks like to view all comic book-based movies as essentially the same: kiddie fodder. Of course, that’s completely inaccurate, as superhero flicks share very little. Some superhero efforts go down a dark, adult path, while others take on a much lighter tone. And that’s usually where Turtles finds us. 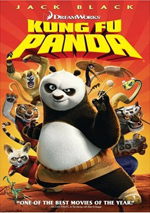 If you want a comic book flick that really shoots for the kiddie demographic, than this is the one for you. Actually, I don’t think the original Turtles comics aimed at the 12-and-under set; I believe they were more ironic and meant to work for older folks. Given the nature of the characters, though, it’s easy to see why the series appealed to kids, and the movie definitely stays focused on a lighter feel. Oh, it has some decent fight scenes and a few darker moments, but it prefers comedy and nuttiness. At no point does this threaten to turn into a dark psychodrama. Which is fine, as I definitely think there’s a place for lighter fare. Clearly Turtles struck a vibe with the kiddie audience, as it became a huge hit. Does the film work for adults 19 years after its release? Ehhh, sort of. I don’t think I’d seen Turtles since its theatrical run, so I don’t remember it especially well. I believe I enjoyed it to a moderate degree, but I’m sure I didn’t view it as anything more than decent entertainment. That’s about what I think of it in 2009. On the positive side, the quirkiness of the characters still impresses. The film doesn’t differentiate them as well as I’d remembered, but it does give them their own personalities and offers some charm. I think the flick handles the character effects well, too. Overgrown Muppets like these probably shouldn’t work, but they do. We suspend disbelief pretty readily and accept the turtle puppets with surprising ease; they actually feel strangely real. Unfortunately, Turtles comes with an entirely lackluster story, and the action sequences seem forgettable. They add a little pizzazz to the movie but don’t deliver great excitement. The warmed-over plot doesn’t do us any favors, either. All of which leaves Turtles as a minor pleasure. To be sure, the film works better than many others I’ve seen; it never takes itself too seriously, and the silliness of the main characters actually becomes an endearing plus. However, the flick is too slight and thinly plotted to become anything memorable. Casting footnote: of the main actors, only Elias Koteas went on to any real success. However, if you look hard, you’ll find Sam Rockwell here as “head thug”. Teenage Mutant Ninja Turtles appears in an aspect ratio of approximately 1.85:1 on this Blu-ray Disc. The film provided an extremely inconsistent transfer. Perhaps my biggest complaint related to grain. Various source effects created few concerns, as I saw only a speck or two, but the movie could often be extremely grainy. That factor affected pretty much every other aspect of the image, especially in terms of colors. I thought the hues tended to be somewhat messy; some of that came from the crummy 1990 film stock, but the heavy grain meant that the colors looked flat. The grain also affected sharpness. At best, the movie displayed pretty good delineation, though it rarely looked really good. The shots at April’s farm seemed like the best of the bunch. Much of the movie came across as a bit soft, though, as it often appeared tentative. Blacks were decent, but shadows looked dense. Again, the grain was an issue, the not the only one; even shots without much grain looked somewhat thick and opaque. To some degree, I expect the problematic visuals stemmed from the source. As I mentioned, some 1990 film stocks haven’t held up well, and I couldn’t but wonder if Turtles ever looked good. I have to assume it once looked better than this, though, as the spotty visuals would’ve been pretty iffy in 1990 as well. I know this is an aging movie made on a low budget, but I still think it shows surprisingly weak visuals. Don’t expect much from the Dolby TrueHD 5.1 soundtrack of Turtles, either. Given the movie’s age and budget, I might’ve anticipated a low-key affair, but the opposite was true. The soundfield was way too active, and that created distractions. Actually, it’s not the level of activity that’s the main problem – it’s the weak localization. The mix threw out all sorts of audio but didn’t bother to place it well. Various effects cropped up in illogical spots, as the mixers seemed to go with a “more is better” approach. Music also filled the room in an overwhelming way. Stereo separation wasn’t good, as the score spread all around the spectrum. In terms of quality, someone decided to make this a bass-fest. Low-end became awfully heavy and dominated the track. I like good bass, but the audio went too far and turned into a boomy mess at times. Other aspects of the audio quality were acceptable and that was about it. Speech remained intelligible and reasonably natural, though some reedy and edgy elements appeared. Effects showed passable accuracy, but they also threw out too much bass at times. Overall, this was a track that tried too hard to overwhelm us. Only two disc-based extras appear here: the film’s trailer and a 63-second Sneak Peek at the TMNT: Smash-Up game for the Wii. However, the “25th Anniversary Collector’s Edition” – which is currently the only way to get this flick on Blu-ray – includes a few non-disc-based components. Of most interest, we get a comic book. This offers a black and white adaptation of the first Turtles movie. Done by Turtles creators Kevin Eastman and Peter Laird, it’s a fun way to experience the film’s story. We also find Photo/Biography Cards for eight characters, a sketch “signed” by Laird, and a “radical” beanie. The cards are nice; they look good and they have nice biographies on them. The sketch is less interesting, and since I’ll assume the signature is just a reproduction, it loses impact. As for the beanie… if anyone actually wears one of those in public, I’ll be shocked. Almost 20 years ago, Teenage Mutant Ninja Turtles became a surprise hit. Viewed after all that time, the movie boasts some moderate charms and still offers acceptable entertainment value, but it never turns into anything especially winning. The Blu-ray provides erratic visuals, muddy audio, and only minor extras. I can take some pleasure from the movie, but this release doesn’t impress. 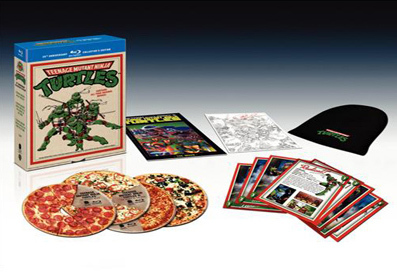 Note: the Turtles Blu-ray currently appears only as part of a “25th Anniversary Collector’s Edition” boxed set. This also includes 1991’s Teenage Mutant Ninja Turtles II: The Secret of the Ooze, 1993’s Teenage Mutant Ninja Turtles III: Turtles In Time, and 2007’s TMNT.